Equipment: Toaster. Television. Microwave. Coffee Maker. Building amenities: Solarium. Balcony. Colonial Style. 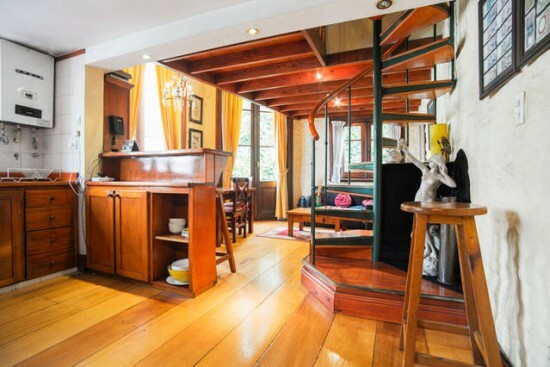 Loft-type apartment located in an historical building, super warm and quiete. Finally, a private terrace with wooden tables and chairs, full of plants. El departamento es cómodo y bonito. Está muy bien ubicado, en el corazón de san telmo! la gente de la agencia fue muy atenciosa y siempre estuvo disponible cuando los necesitamos. Hermosa experiencia! Lo pasamos rebien. Lindo departamento, muy bien ubicado. Pleased about: location, communication with casa San Telmo, plenty of space and a good rooftop terrace (poorly furnished). We had trouble turning on the gas oven in order to heat up the apartment, but over all very happy. Nous avons passe un sejour tres agreable dans l'appartement sur Cochabamba,tres bien situs dans le vieux San Telmo a proximity de tout. This is our last night in your lovely apartment and we are all so sad, it has been a delightful week, what a privilege to be living in the heart of this great San Telmo. Everything has been perfect, thank you so much for sharing this delightful spot with us. Our friends were so envious of us, none of their places had the character or soul of this beautiful spot. The weather was nice and the apartment perfect. Every time we were sitting on the balcony we noticed people stopping or at least slowing down and look up, we could for a second believe they were admiring us, but we do think it was the look of the apartment. Our stay was fabulous and made that much better by Ramin. It truly was a wonderful experience.